Tie a ribbon bow on center of lollipop sticks. Add a gum drop to the end of each stick. With a toothpick poke a hole inside of each cupcake. Insert plain end of lollipop stick into the hole to form rattle handle. 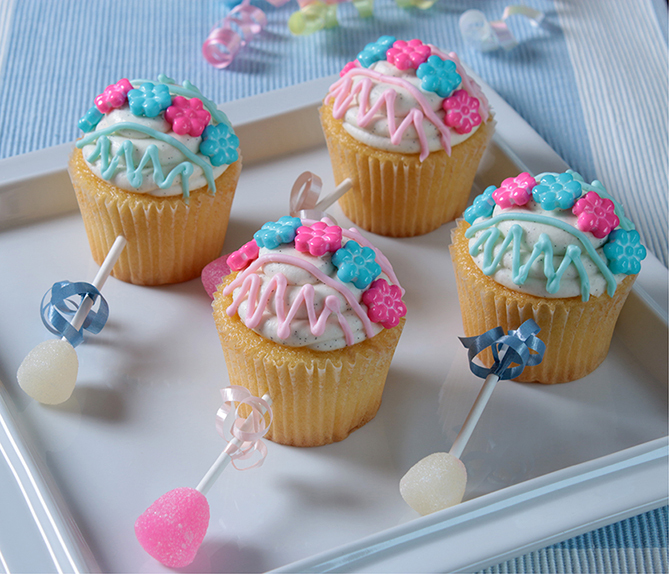 Decorate top of cupcakes attractively with your favorite candies and frosting to resemble baby rattles. To pipe the lines of colored frosting you can buy tubes of decorating frosting and tips or color white frosting and pipe through a piping bag with tip cut off to make a small hole.